What Can You Do to Prevent Vaping? What to Say About Vaping? It’s been around for over a decade, but vaping’s popularity exploded in 2017, taking many families, schools and healthcare providers by surprise. Vaping, or Juuling (named after a popular vape device called JUUL), is the inhalaing and exhaling of an aerosol produced using a vape device. Nearly one in three high school seniors tried vaping in the past year.1 With advertising geared toward teens and young adults, devices designed to attract attention and thousands of flavors to choose from, the expectation is that growth will continue. For every story touting the benefits of vaping, there is an equal number raising concerns about its risks. 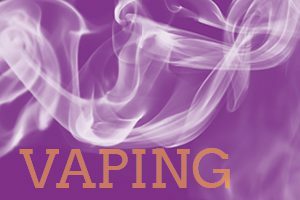 The information here and in the accompanying vaping guide is meant to help you understand vaping, its appeal to youth and what research has to say about the known and unknown risks. 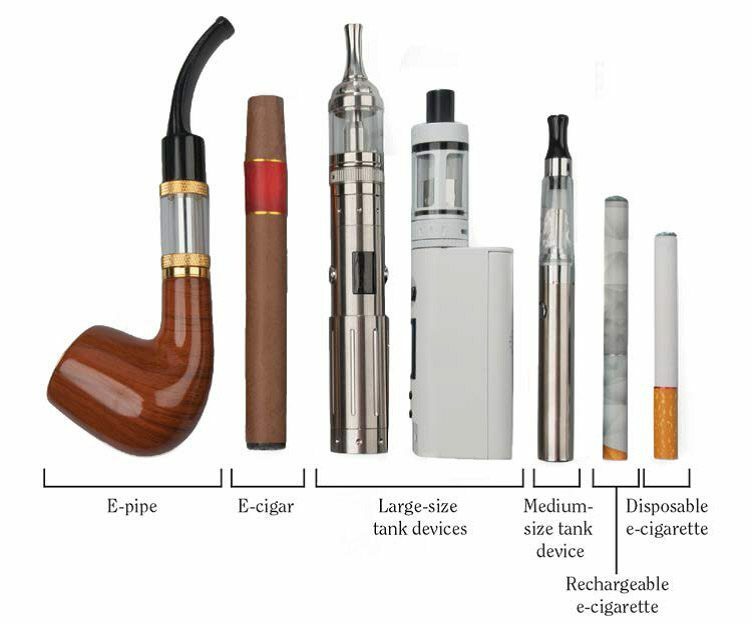 Vape devices, known as e-cigs, e-hookahs, mods, vape pens, vapes, tank systems and Juuls, contain four basic components: a cartridge or tank to hold e-liquid (or e-juice/vape sauce), a heating element known as an atomizer, a battery and a mouthpiece to inhale. A sensor detects when a person is trying to inhale. This triggers the battery to supply electricity to the atomizer. The heat given off vaporizes the e-liquid. The resulting vapor is what is inhaled. What do vape devices look like? Some vape devices mimic cigarettes, cigars or pipes while others resemble USB sticks and other everyday objects like a guitar pick. Larger devices like tank systems, or “mods,” look more like a small cell phone. Some devices are disposable while others can be recharged and refilled. Many substances can be vaped, but the most common are variations of flavored e-liquids which come in small bottles or pre-filled pods or cartridges. Flavored e-liquids come in thousands of flavors ranging from cotton candy and grape to king crab legs and hot dog. Flavored e-liquids with differing levels of nicotine. One of the more popular devices, Juul, contains 59 mg/ml of nicotine in each pod, the equivalent of a pack of cigarettes. Vaping was intended to be a less harmful option for adult smokers, but enticing flavors combined with the power of social media to set off trends like “cloud competitions” (think smoke rings and other exhaling tricks) have made it attractive to many teens and young adults. The short answer is no, vaping is not considered safe for teens and young adults, especially since their brains are still in a period of active development. Exposure to nicotine is worrisome in teens and young adults because nicotine can be highly addictive. Due to the fact that the brain is undergoing massive changes during the teen years, nicotine use may rewire the brain, making it easier to get hooked on other substances and contribute to problems with concentration, learning and impulse control. Most vape devices release a number of potentially toxic substances, although exposure is considerably lower than those found in regular cigarettes. Dependence develops when the body adapts to repeated exposure to vaping. When a person stops vaping, he or she can experience withdrawal symptoms, although likely not as intense as with conventional cigarettes. Vaping may be increasing risks of smoking. Teens and young adults who vape are almost four times as likely as their non-vaping peers to begin smoking cigarettes. Injuries and poisonings have resulted from devices exploding and direct exposure to e-liquids. Long-term studies are needed to evaluate the risks of cancer and respiratory illness, though there is some concern that vaping can cause coughing and wheezing and may exacerbate asthma. What Can Parents Do to Prevent Vaping? Be equipped with facts. Download the vaping guide for parents and read it over. Remain familiar with vape devices, what’s being vaped and the risks associates. Have conversations. Opportunities to discuss vaping can present themselves in many ways: letters from the school, advertisements, seeing it on TV, walking by someone vaping or passing a vape shop. Be ready to listen rather than lecture. Try using an open-ended question like “What do you think about vaping?” to get the conversation going. Convey your expectations. Express your understanding of the risks along with why you don’t want your child vaping. If you choose to set consequences, be sure to follow through while reinforcing healthier choices. Be a good role model. Set a positive example by being vape and tobacco-free. If you do vape, keep your equipment and supplies secured. Q: Isn’t vaping safer than smoking cigarettes? Exposure to toxic substances may be reduced, but there are still significant concerns when replacing smoking cigarettes with vaping. One’s lungs are exposed to fine particles, metals, other toxins and nicotine which are all harmful. You may use the example that “Driving 90 miles an hour with a seat belt on is safer than without one, but neither is safe.” The same goes for vaping. And as with all substance use, ask your child why they’re interested in vaping in the first place. Q: Everyone is doing it, why do you care? Q: You smoke, so why shouldn’t I? Get information and guidance on how to prevent and address vaping with your kids. Download it, print it and keep it handy. We do everything we can to keep our kids safe. When it comes to teen drug use, why do so many parents shrug it off as "a rite of passage?" There isn’t one script for talking about marijuana, but here's what you’re likely to hear -- and a few suggestions for how to respond. Alcohol is the most used substance among teens and young adults, posing substantial health and safety risks. Learn what to say about it.